The "Los Angeles Angels" name originates from the first Los Angeles-based sports team, the Los Angeles Angels, who took the name "Angels" from the English translation of "Los Angeles", which means "The Angels" in Spanish. The team name started in 1892; in 1903, the team name continued in L.A. through the PCL, which is now a minor league affiliate of MiLB. The Angels franchise of today was established in MLB in 1961 after former owner Gene Autry bought the rights to continue the franchise name from Walter O'Malley, the former Los Angeles Dodgers owner who had acquired the franchise from Phil Wrigley, the owner of the Chicago Cubs at the time. As stated in the book Under the Halo: The Official History of Angels Baseball, "Autry agreed to buy the franchise name for $350,000, and continue the history of the previously popular Pacific Coast League team as his own expansion team in the MLB." After the Angels joined the Major Leagues, some players from the Angels' PCL team joined the Major League Angels in 1961. Orvon Grover "Gene" Autry was an American singer, songwriter, actor, musician and rodeo performer who gained fame as a singing cowboy in a crooning style on radio, in films, and on television for more than three decades beginning in the early 1930s. Autry was the owner of a television station, several radio stations in Southern California, and the Los Angeles/California/Anaheim Angels Major League Baseball team from 1961 to 1997. The Los Angeles Angels were a Minor League Baseball team based in Los Angeles that played in the "near-major league" Pacific Coast League from 1903 through 1957. The team's founder, entertainer Gene Autry, owned the franchise for its first 36 years. During Autry's ownership, the team made the playoffs three times, but never won the pennant. The team has gone through several name changes in their history, first changing their name to the California Angels on September 2, 1965, with a month still left in the season, in recognition of their upcoming move to the newly constructed Anaheim Stadium in Anaheim at the start of the 1966 season. When The Walt Disney Company took control of the team in 1997, it extensively renovated Anaheim Stadium, which was then renamed Edison International Field of Anaheim. The City of Anaheim contributed $30 million to the $118 million renovation with a renegotiated lease providing that the names of both the stadium and team contain the word "Anaheim". The team was renamed the Anaheim Angels and became a subsidiary of Disney Sports, Inc. (later renamed Anaheim Sports, Inc.). Under Disney's ownership and the leadership of manager Mike Scioscia, the Angels won their first pennant and World Series championship in 2002. Anaheim Sports, Inc., formerly Disney Sports Enterprises, Inc. (DSE), was a fully owned subsidiary of The Walt Disney Company based in Anaheim, California and created in 1992 as the ownership group for the Mighty Ducks of Anaheim professional hockey team. The 2005 Major League Baseball season was notable for the league's new steroid policy in the wake of the BALCO scandal, which enforced harsher penalties than ever before for steroid use in Major League Baseball. Several players, including veteran Rafael Palmeiro, were suspended under the new policy. Besides steroids it was also notable that every team in the NL East division finished the season with at least 81 wins. Additionally it was the first season featuring a baseball team in Washington, D.C. after more than 4 decades, with the Washington Nationals having moved from Montreal. City of Anaheim v. Angels Baseball LP is a lawsuit filed in Orange County, California Superior Court by the city of Anaheim, California against the owners of the Los Angeles Angels of Anaheim Major League Baseball franchise, concerning the team's official name. The lawsuit and a related political and public relations battle sought to reverse the team's official name change from Anaheim Angels to Los Angeles Angels of Anaheim, which the city characterized as a breach of the team's lease on the city-owned Angel Stadium of Anaheim. The city was unsuccessful, as both a trial jury and an appellate court ruled in the team's favor. Anytime the Angels win a game, the saying "Light Up the Halo! ", or "Light That Baby Up!" is used in reference to the giant landmark which is a big 230 foot tall A with a halo surrounding the top which lights up every time the Angels win a game. 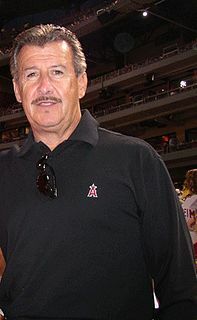 Fans also use the saying, "Just another Halo victory", as the late Angels broadcaster Rory Markas, who would say the catch phrase after each win. The Angels have developed many rivalries in and also outside of their division. They include the New York Yankees,  Texas Rangers,  Oakland Athletics, and the neighboring Los Angeles Dodgers. The rivalry with the Los Angeles Dodgers has been referred to as the Freeway Series because of the freeway system (mostly via I-5) linking the two teams' home fields. The Freeway Series rivalry developed mostly over the two teams sharing similar regions and fans having been split in Los Angeles, similar to the Chicago Cubs vs. Chicago White Sox rivalry, the San Francisco Giants vs. Oakland A's rivalry, or the New York Mets vs. New York Yankees rivalry. As of 2015, the Angels fans have set 6 Guinness World Records for the largest gatherings of people wearing blankets, wrestling masks, cowboy hats, wigs, Santa hats, superhero capes, and sombreros. They've also set the world record for largest gathering of people with selfie sticks. In 2009, the Angels were voted the number one franchise in professional sports in Fan Value by ESPN magazine. In 2011, ESPN & Fan polls by ESPN ranked the Angels #4 in the best sports franchises, ahead of every Major League team in baseball at #1 and also making it the #1 sports franchise in Los Angeles. The rankings were determined through a combination of sports analysts and fan votes ranking all sports franchises by a combination of average fan attendance, fan relations, "Bang for your Buck" or winning percentage over the past 3 years, ownership, affordability, stadium experience, players effort on the field and likability, coaching, and "Title Track". As of 2009 [update] , the Angels' flagship radio station is KLAA 830AM, which is owned by the Angels themselves and ESPN. It replaces KSPN (710 ESPN), on which frequency had aired most Angels games since the team's inception in 1961. That station, then KMPC, aired games from 1961 to 1996. In 1997 & 1998, the flagship station became KRLA (1110AM). In 1999, it was replaced by KLAC for four seasons, including the 2002 World Series season. In 2009, KFWB 980AM started broadcasting 110 weekday games, including postseason games, to better reach listeners in Los Angeles County and other areas to the north. All 162 games plus post season games still air on KLAA. From 1994 until the end of the 2012 season, the public address announcer for most Angels home games was David Courtney, who also served as the public address announcer for the Los Angeles Kings and Los Angeles Clippers and a traffic reporter for Angels flagship KLAA 830 AM until his death on November 29, 2012,. Starting in the 2013 season, Michael Araujo, the PA Announcer for the LA Galaxy since 2002, was selected as the new public address announcer for the Angels. Anaheim Ducks announcer Phil Hulett serves as the secondary public address announcer. The team is also featured in the 1988 comedy film The Naked Gun . During Disney's ownership of the Angels, the team was also featured in Air Bud: Seventh Inning Fetch , Deuce Bigalow: Male Gigolo , and TV movie Angels in the Infield . Arturo "Arte" Moreno is an American businessman. On May 15, 2003, he became the first Mexican-American to own a major sports team in the United States when he purchased the Anaheim Angels baseball team from the Walt Disney Company. Garret Joseph Anderson is an American former professional baseball left fielder. He played in Major League Baseball (MLB) for the California / Anaheim Angels / Los Angeles Angles of Anaheim, Atlanta Braves, and Los Angeles Dodgers between 1994 and 2010. He holds Angels franchise records for career games played (2,013), at bats (7,989), hits (2,368), runs scored (1,024), runs batted in (RBI) (1,292), total bases (3,743), extra base hits (796), singles (1,572), doubles (489), grand slams (8), RBI in a single game (10) and consecutive games with an RBI (12), as well as home runs by a left-handed hitter (272). A three-time All-Star, he helped lead the Angels to the 2002 World Series title, and was named Most Valuable Player of the 2003 All-Star Game. The Freeway Series is a Major League Baseball (MLB) interleague rivalry played between the Los Angeles Angels and the Los Angeles Dodgers. The Angels are members of the American League (AL) West division, and the Dodgers are members of the National League (NL) West division. The series takes its name from the massive freeway system in the greater Los Angeles metropolitan area, the home of both teams; one could travel from one team's stadium to the other simply by driving along Interstate 5. The term is akin to Subway Series which refers to meetings between New York City baseball teams. The term "Freeway Series" also inspired the official name of the region's NHL rivalry between the Los Angeles Kings and the Anaheim Ducks: the Freeway Face-Off. 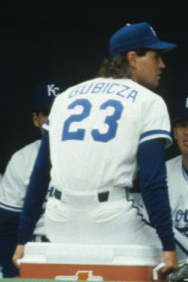 Mark Steven Gubicza is a retired Major League Baseball pitcher who played for 14 major league seasons with the Kansas City Royals (1984–96) and California Angels (1997). He currently does color commentary for Los Angeles Angels games on Fox Sports. The 1965 California Angels season was the fifth year of play for the American Major League Baseball franchise. The 1965 Angels finished seventh in the American League with a record of 75 wins and 87 losses, putting them 27 games behind the AL Champion Minnesota Twins. 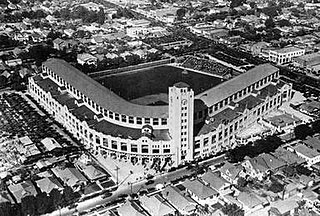 It was also the final season for the franchise in the city of Los Angeles before moving to their new stadium in nearby Anaheim for the following season. In their fourth and last year as tenants at Chávez Ravine, the Angels drew only 566,727 fans, eighth in the ten-team Junior Circuit and almost two million fans fewer than their landlords, the Dodgers, who were en route to the 1965 world championship. The Los Angeles Angels are a professional baseball team is based in Anaheim, California. The Angels compete in Major League Baseball (MLB) as a member club of the American League (AL) West division. 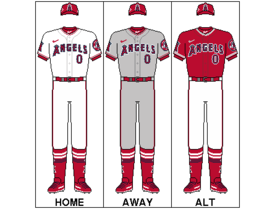 The "Angels" name originates from the city that was their original home, Los Angeles, and was inspired by a minor league club of the same name. The Angels have played home games at Angel Stadium since 1966. The Los Angeles Angels of Anaheim's 2012 season was the franchise's 52nd season and 47th in Anaheim. The Angels would miss the playoffs for the 3rd straight, even though they had an 89-73 record as a 3rd seed team in the AL West. The 1961 Major League Baseball expansion resulted in the formation of two new Major League Baseball (MLB) franchises in the American League (AL). A new club was started in Washington, D.C. and took the existing name of the Senators, as the previous team of the same name moved to Minneapolis–St. Paul for the start of the 1961 season and became the Minnesota Twins. 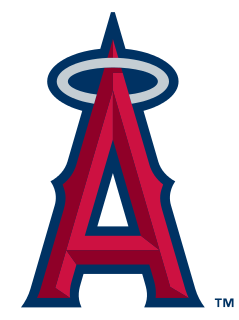 The second new franchise was granted to an ownership group led by Gene Autry for a team in Los Angeles who named themselves the Angels. The two new teams each paid a fee of $2.1 million and became the 17th and 18th franchises in MLB. The Big A Sign is a 230-foot-tall (70 m), 210-ton red metal sign in the shape of the letter "A" with a halo on top, situated in the parking lot of Angel Stadium in Anaheim, California. The sign was originally installed in 1966 behind the left field fence but was moved to the parking lot in 1979 when American football's Los Angeles Rams started sharing the stadium with MLB's Los Angeles Angels. The sign is also responsible for the nickname of Angel Stadium as "The Big A". ↑ "Angels Directory" (PDF). 2018 Los Angeles Angels Information Guide. MLB Advanced Media. March 2, 2018. Retrieved March 28, 2018. (Subscription required (help)). ↑ "Official Twitter of the Los Angeles Angels". Twitter. Retrieved 24 May 2017. ↑ "The official Instagram account of the Los Angeles Angels". Instagram. Retrieved 24 May 2017. ↑ "Los Angeles Angels". Facebook. Retrieved 24 May 2017. ↑ Gonzalez, Alden (August 31, 2013). "Report: After vote, Halos may drop 'of Anaheim'". MLB Advanced Media. Archived from the original on August 18, 2017. Retrieved May 27, 2018. ↑ Benne, Jon (September 4, 2013). "Angels dropping Anaheim from name". SB Nation . Retrieved May 30, 2017. ↑ Schoch, Josh (September 4, 2013). "Angels Will Finally Be Allowed to Drop Anaheim from Their Team Name". Bleacher Report . Retrieved June 1, 2017. ↑ Shaikin, Bill (2013-08-30). "'Los Angeles Angels of Anaheim' could be no more". Los Angeles Times. ISSN 0458-3035 . Retrieved 2017-06-18. ↑ Creamer, Chris (June 28, 2017). "Of Anaheim No More, Los Angeles Angels Officially Changed Name". SportsLogos.net. Retrieved August 17, 2017. ↑ Marroquin, Art; Tully, Sarah (January 7, 2015). "Los Angeles Angels of Anaheim: 10 years later, how big of a deal was the name change". Orange County Register. Retrieved June 18, 2017. 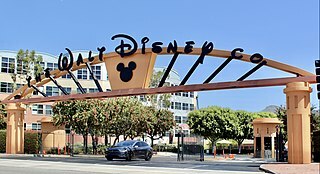 In 2013, the City Council initially approved a memorandum of understanding that would allow the team to strip the “of Anaheim” from its name, as well as other financial arrangements. Follow-up negotiations, however, haven’t happened – and the Angels have threatened to leave Anaheim. ↑ Shaikin, Bill (2016-09-27). "Move into a new stadium? Renovate the old one? Angels could just play out their lease in Anaheim". Los Angeles Times. ISSN 0458-3035 . Retrieved 2017-06-18. ↑ Moura, Pedro (2017-02-18). "Angels to stay in Anaheim through at least 2029". Los Angeles Times. ISSN 0458-3035 . Retrieved 2017-06-18. ↑ Spencer, Lyle. "Halos-Yanks rivalry gaining steam as years pass | angels.com". Losangeles.angels.mlb.com. Archived from the original on 2014-02-26. Retrieved 2015-05-14. ↑ Rangers-Angels rivalry: How did we get here? | Texas Rangers Blog Archived May 6, 2014, at the Wayback Machine . Rangersblog.dallasnews.com (2012-05-11). Retrieved on 2013-09-06. ↑ CARLISLE, MARK. "VIDEO: Selfie-stick world record set at Angel Stadium". ↑ "Angels PA announcer David Courtney dies at the 56". Angles.ocregister.com. Archived from the original on 2013-02-02. Retrieved 2015-05-14. ↑ "New Angels announcer living a dream". M.ocregister.com. Archived from the original on 2014-01-30. Retrieved 2015-05-14. ↑ Keith Sharon (28 July 2018). "Hall of Famers Vladimir Guerrero, Trevor Hoffman show baseball's place in Orange County's heart". Orange County Register. Retrieved 31 July 2018. ↑ "Hall of Famers by Category: Player". Archived from the original on August 13, 2006. Retrieved September 3, 2006. ↑ Since 2015, inductee biographies for players, managers, and many executives at the Hall of Fame's website include a "primary team". This listing does not necessarily match an inductee's cap logo. ↑ "Hall of Fame Explorer: Primary team, LA/California Angels". National Baseball Hall of Fame and Museum. Retrieved September 26, 2015. Wikimedia Commons has media related to Los Angeles Angels of Anaheim .